I had about given up on seeing any visually pleasing landscape in the Palm Springs area. Between the desiccated desert climate, the politically induced California drought, and the high walls encapsulating most yards, the image of Palm Springs as an oasis had been shattered. 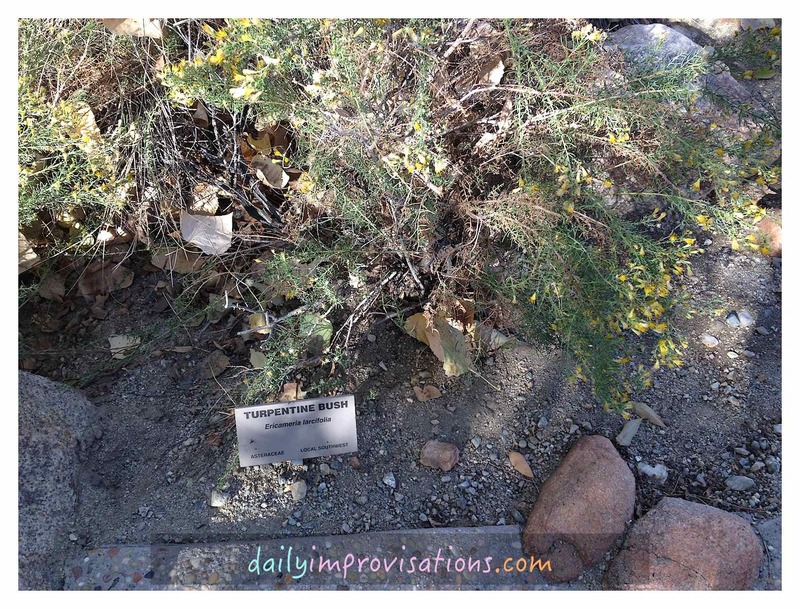 The public so-called gardens we had visited, called Sunnylands, had been a huge disappointment. It was mostly a historical lesson in political power. 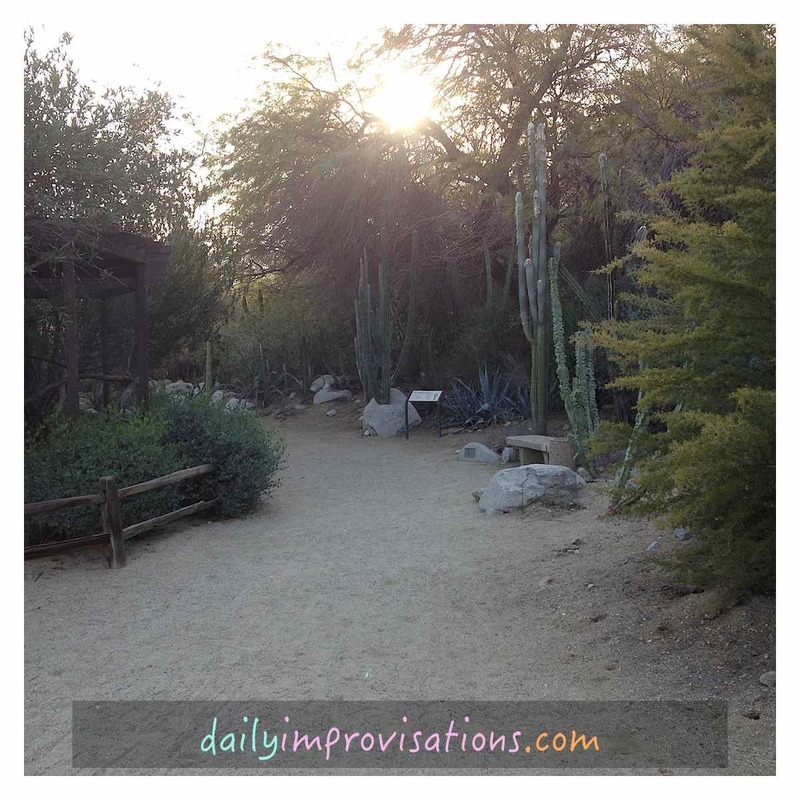 (the above link is to an article on my blog thehappylibertarian.com) Still, on the last day of our vacation, we all agreed to give The Living Desert Gardens and Zoo a try. 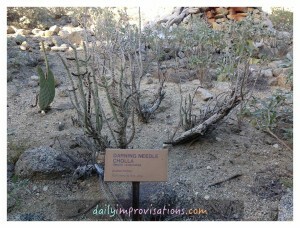 Expectations low, I dressed for a day in the scorching sun looking at snake skins and cactus skeletons. I had been happily barefoot the whole vacation week, except for a rocky 8 mile hike with dear hubby. I cannot yet keep up with him barefoot in the kinds of places he takes me, so I had worn moccasins for that. The rest of the week, all my shopping and running and restaurant going had been barefoot with no confrontations and no complications. However, this day was predicted to be much hotter and I didn’t know what type of sizzling pathways I might encounter. I put my Luna sandals in the rental car. 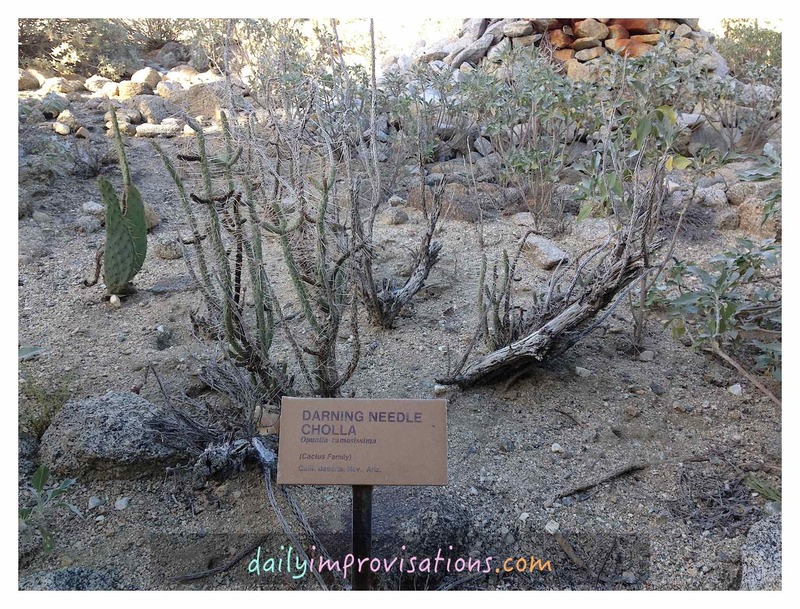 The Living Desert was actually in Palm Desert. (Here is their website: livingdesert.org) We arrived around 1:30 PM, parked in the brick inlaid parking lot, and went through the payment line, me deciding to remain barefoot for now. 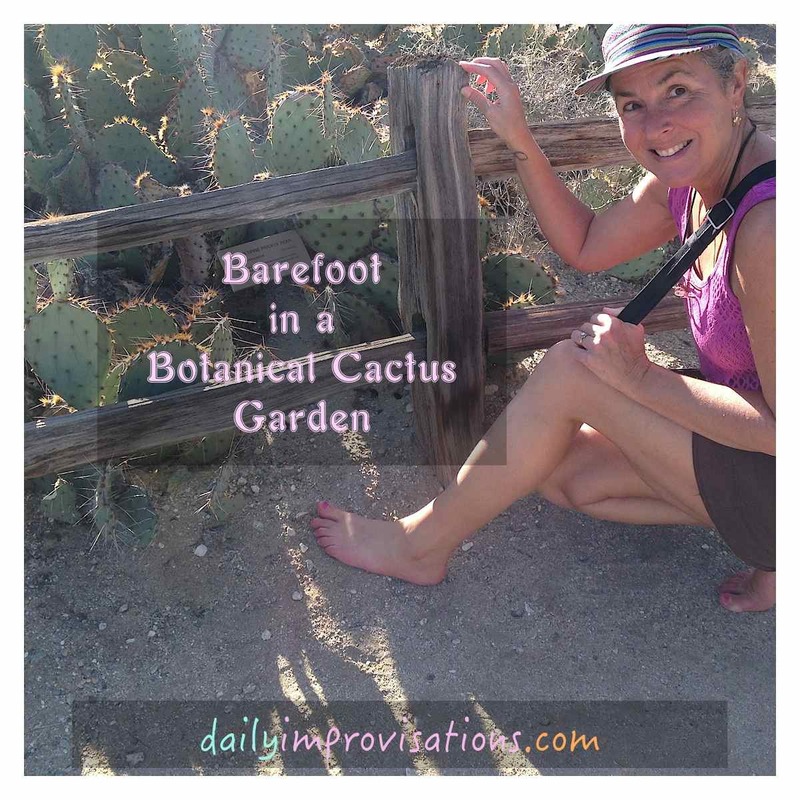 Besides the potential heat, I did not have much experience being barefoot around cacti, and was going to be carefully monitoring my environment. What I found was extremely clean cement walkways interspersed with freshly raked sand side paths. 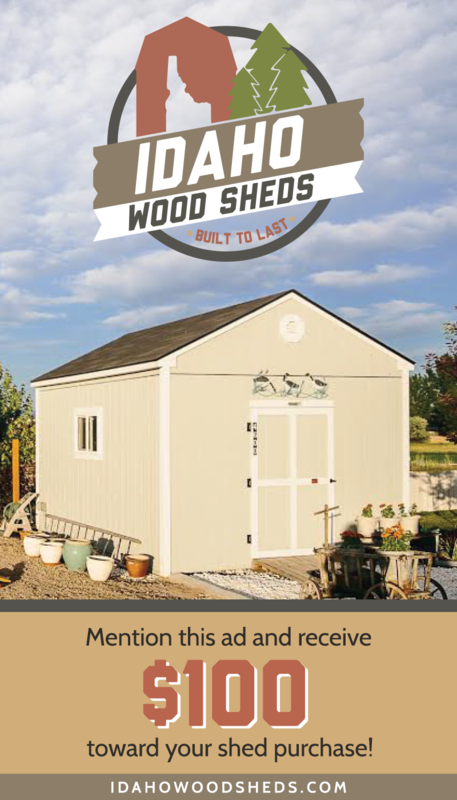 There were also a few wood and rock sections in places like aviaries and dedicated garden displays. 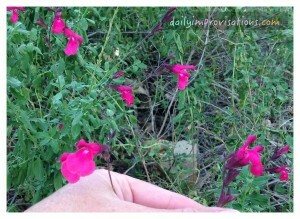 Some delicate dark pink flowers in one of the first dedicated gardens. Even though I was going to be observant, like everyone should be when they are walking around, I wasn’t overly concerned. I have stepped on my fair share of goat head stickers and large burrs while running. 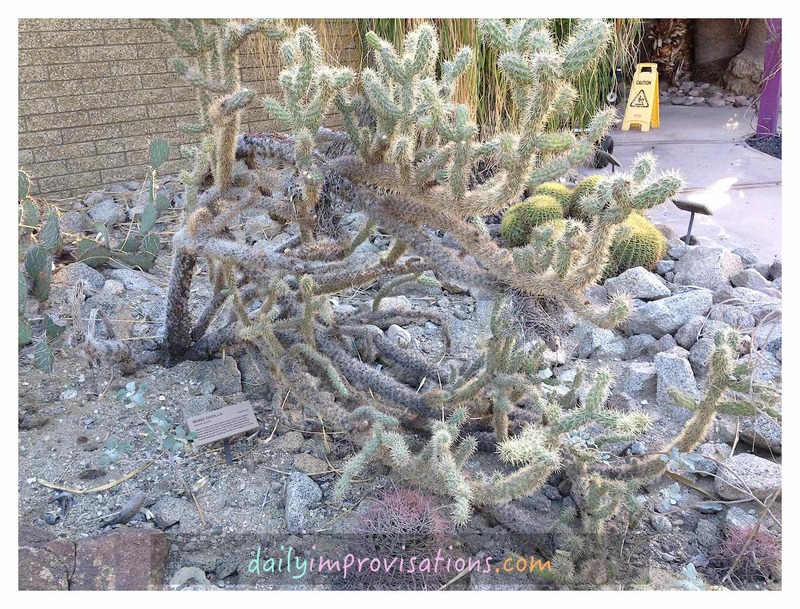 I have also been through various patches of broken glass with no blood. 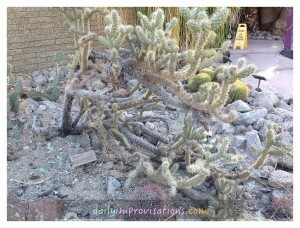 Unless I walked directly on a cactus, most long thorns would be laying horizontal. The pleasure of the gardens was soon predominant in my mind. 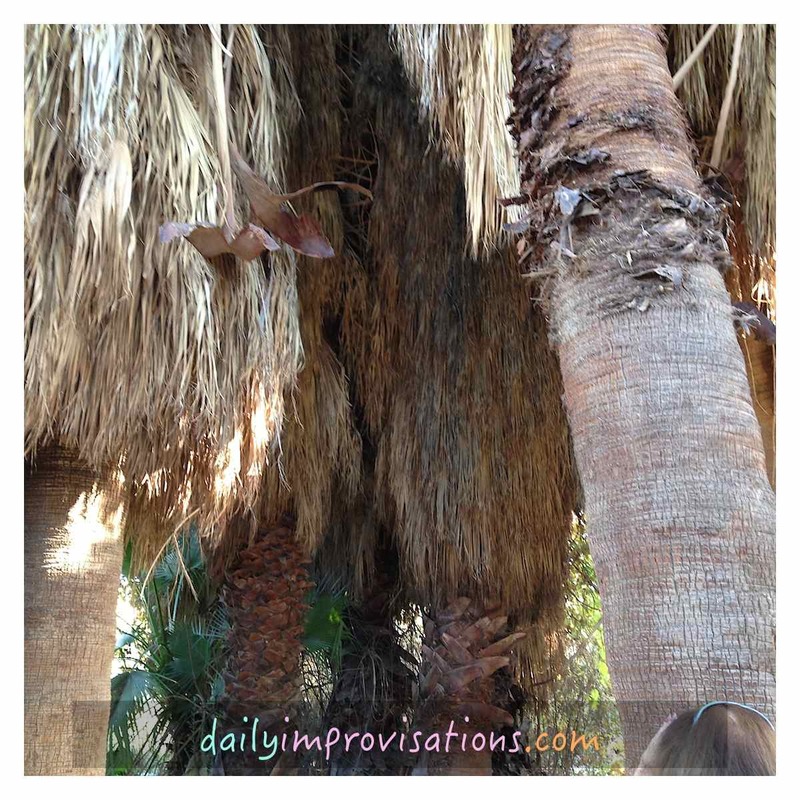 There were a couple of oases, with huge palm trees similar to some we had seen on our hike (post pending on funfitnessafter50.com) In one oasis, there was a grand owl, a wild guest, napping high up in between palm fronds, but close enough that it was a thrill to see it. The aviaries were not huge, but the birds were relaxed and practically posed for photos. 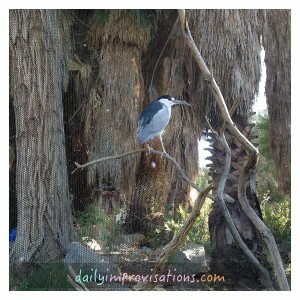 A very gentlemanly black crowned night heron in the aviary next to an oasis. These are the large palm trees you can see through the aviary netting in the above photo. The wild owl is sitting up between the two trees near the back, kind of behind the dry curled something in the middle forefront of the photo, just for perspective. You can see him more clearly in the next photo. And there is the wild owl, ignoring us all while he sleeps. He did “who” dreamily in his sleep once. One highlight was the butterfly garden. On our way there, my mother-in-law and I were informed by a passing guide that we shouldn’t expect to see any butterflies. It wasn’t the right time of year yet. Much to our delight, a flurry of the delicate Monarchs hovered around while we were there. 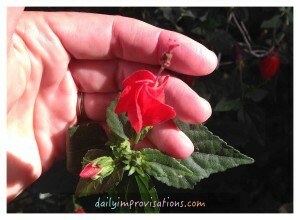 Another bit of excitement occurred when a hummingbird thoroughly checked us out. 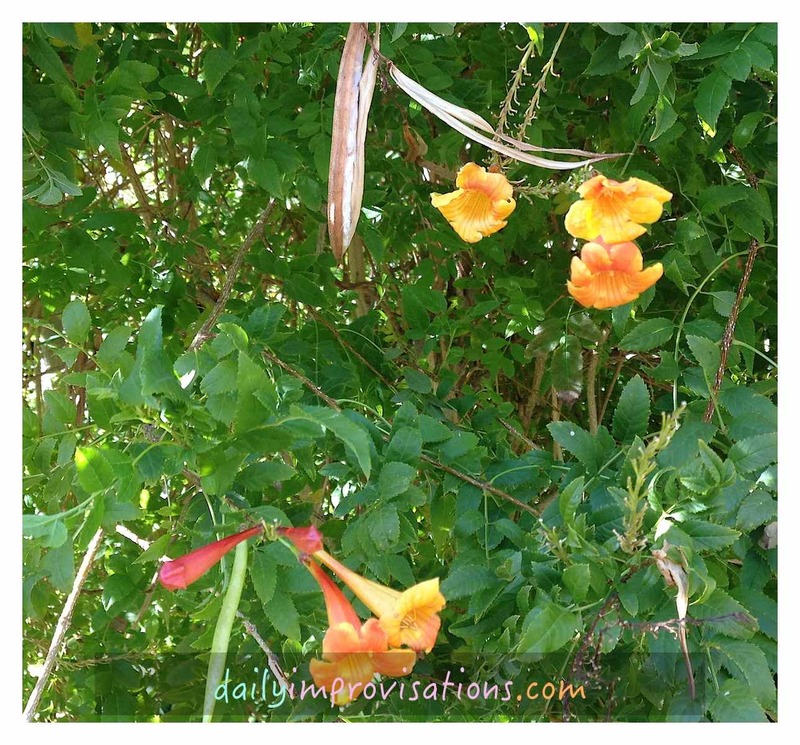 In its garden, there was a profusion of trumpet shaped flowers on a large shrub, but it was taking time to look us over from several different angles. 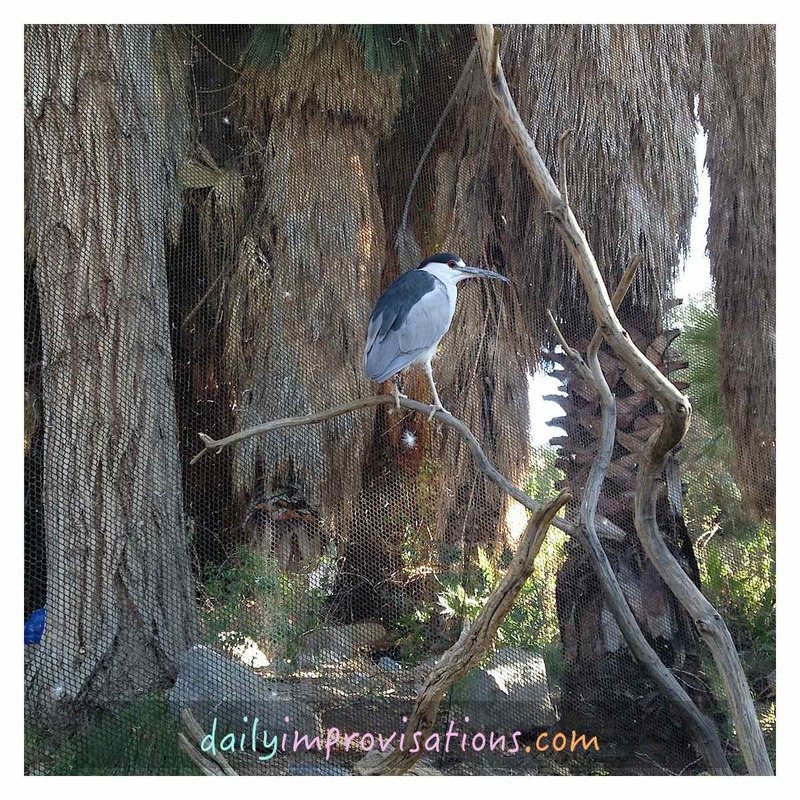 Our quick movements of surprise and then to see it as it darted this way and that around our heads did not seem to fluster it, but after a few minutes, it went on to other exploration. 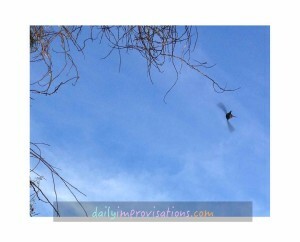 My best live action shot of a hummingbird doing aerial acrobatics around my head. 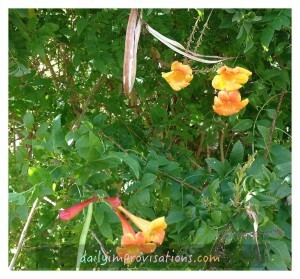 A few of the yellow trumpet flowers in the hummingbird garden. A sample native village was set up in one section and seemed to be particularly popular with some sort of small black ant. I noticed the insects before anyone else, because, of course, they were tickling my feet and ankles. I think a couple of them may have nibbled at me. But since there were no shoes and socks for them to get into, it was simple to brush them off and proceed. Around that area, I also stepped on the only cactus pokey that I noticed. I felt a slight prick, so lifted my foot to see what it was. It was attached to my leathery sole like worn velcro. I removed it and tossed it into the adjacent garden bed. 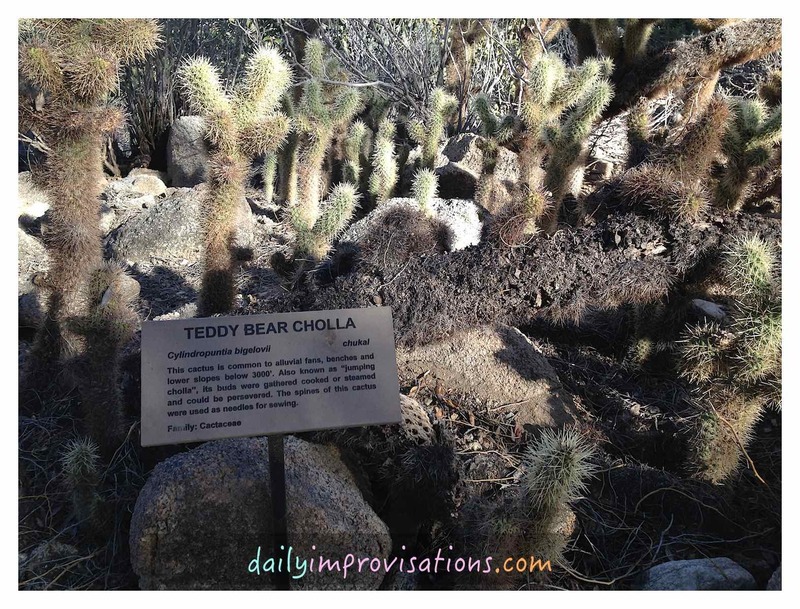 The gardens were planted right up next to the pathways, so I was continually walking close to cacti, but this was the only “encounter” I had. One of the wider sandy paths around the gardens. 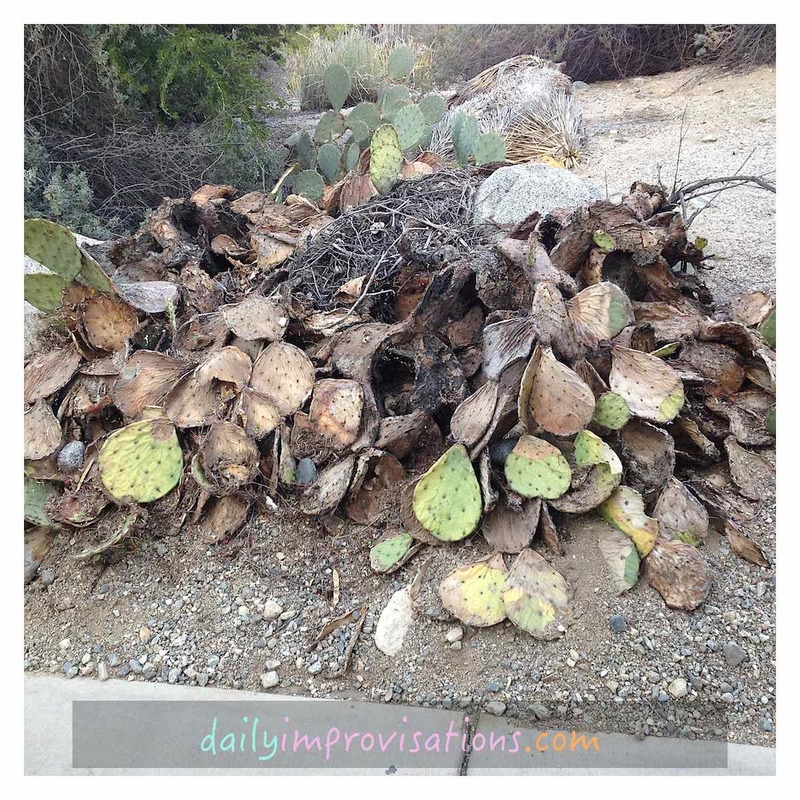 Dear husband had wandered some by himself and happened to overhear a guide explain about a large spreading mound of dead cactus along one major path. It was the only really stressed plant we saw that day. 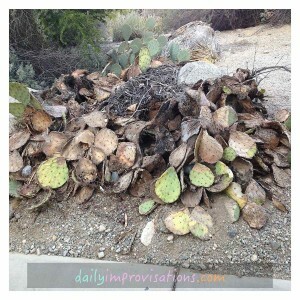 The story is that the crew went to clean it up, but found a nest of pack rats living there. This was apparently quite acceptable, as they left it. If you lose your keys, they suggest you check there. As it turned out, it never got terribly hot, at least not that I noticed. I know my feet have toughened up over the last few summers, but I still can reach my limit with hot surfaces sometimes. 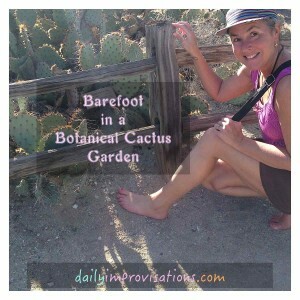 I was pleased to be able to spend the whole nearly 4 hours at the garden-zoo totally barefoot. My legs felt about as fresh when we ended as when we started, although my brain was tired of looking at things and I was getting hungry. We looked at the animals in sort of fast forward as we made our way to the exit, stopping longer once in a while for a particularly interesting specimen. I wasn’t there for the animals, as it always seems a bit flat to go to a zoo without any kids. Still, there were some animals that weren’t part of the normal repertoire in my zoo expeditions. Most looked content, although we felt sad for the eagles in the cages. And the wolf looked dog-faced depressed. 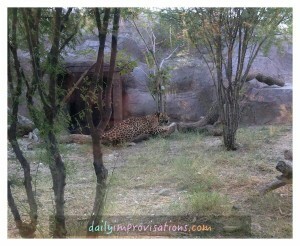 I took photos, but this one of the leopards will give you a taste of the wildlife. The other big cats were hiding, but the leopards were out pacing. The wide gap between them and the low fence was apparently keeping them contained, but there was definitely an open feeling for us observers. 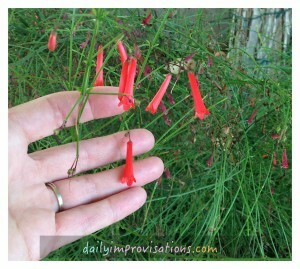 These thin red flowers made me think of penstemons, but I didn’t see signs for most of the flowers. swirly flowers – I attempted a short search to identify, but it was not going to be easy. Since I don’t have any pressing need to know, I’m sticking with this name and just enjoying how it looks. As for the being barefoot, I hope I’ve helped you see that it was just a normal variation of using my feet comfortably and wisely. Just as we are all constantly evaluating how to dress for the weather, often exposing legs, arms, and head when there are not extreme reasons to cover them, bare feet are an option. An option just as reasonable as choosing not to wear gloves most of the time because we can better use our hands bare to take advantage of their full potential in most instances. I got the impression that most people at the garden/zoo who saw me were intrigued, and some were jealous. They probably also went home and took their shoes off as soon as they felt they could. 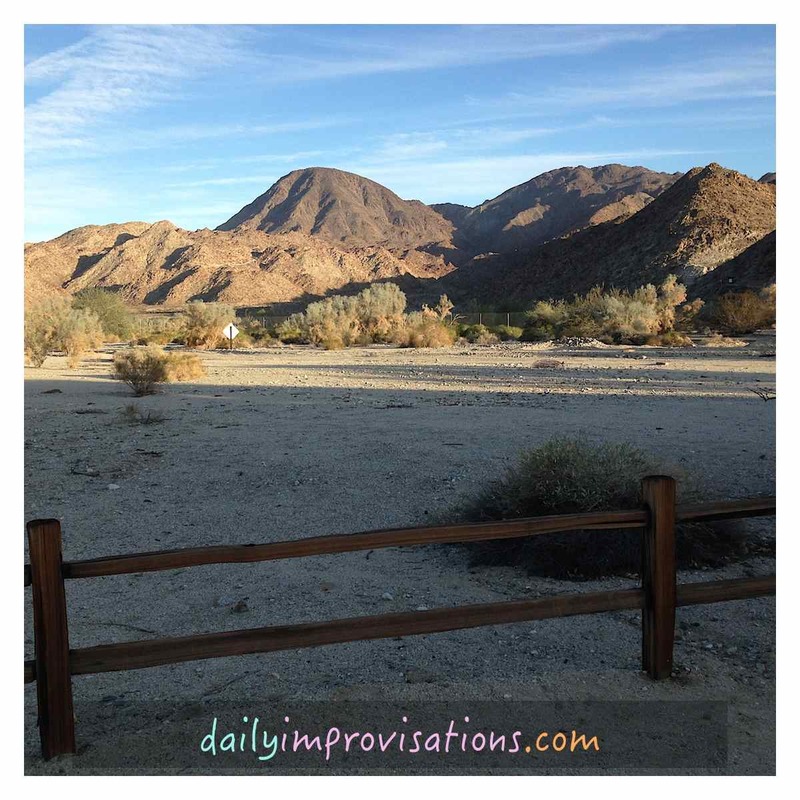 What the natural landscape looks like right next door to the Living Desert, so you know they have done some work to plant and maintain their part.